Love these floral cupcake toppers from Little Sugar Tops of San Antonio. Check out their Etsy shop, where you can buy cupcake toppers (and then tell people you slaved away all day!). My cousin attends High Point University in North Carolina and for her birthday we decided to send her cupcakes. Knowing Magnolia Bakery’s cupcakes are her favorite we wanted to send her a half dozen but quickly realized the shipping from New York to North Carolina was crazy and cost more than the cupcakes! Instead we decided to try to find something more local and affordable. In our search we came across Little Bit O’Spice and we were incredibly happy to purchase the cupcakes from them. 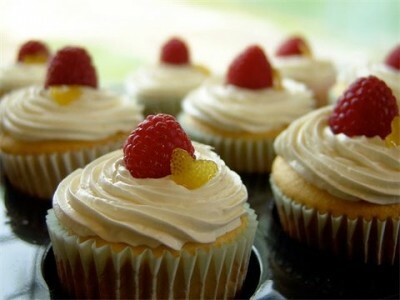 Little Bit O’Spice, located in High Point, North Carolina, makes custom cakes, cupcakes, and pies. After calling to inquire about placing an order we found out how easy Little Bit O’Spice made the process, she was even willing to deliver the cupcakes to the dorm at the University! We needed to order a minimum of a dozen cupcakes so we chose six vanilla and six Oreo. Little Bit O’Spice offered to include a card and was willing to work with us on the delivery date. She took PayPal for payment and for a $3.00 fee was able to deliver the cupcakes to the dorm as long as she had the dorm name and the recipients phone number. I talked to my cousin on Saturday after she received her birthday cupcakes and she loved them. She said that it was a great surprise and the cupcakes were great. You can place orders by calling 336-905-4353 or through Little Bit O’Spice’s website where you’ll find other items like cupcakes on pretzel sticks! Baked By Melissa is a New York City based cupcake bakery that specializes in mini cupcakes. Creator Melissa Bushell bakes stuffed mini cupcakes so customers can try every cupcake without feeling guilty. 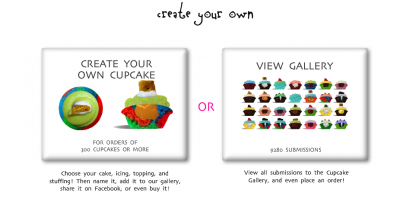 The Baked By Melissa has a unique option, the create your own cupcake customizer! While the custom cupcake can only be used to purchase orders of 300 or more mini cupcakes it is really fun to choose your cake, icing, topping, and stuffing, plus you pick the colors! Once you name it, it can be added to the gallery, shared on Facebook, or as mentioned, you can buy it. 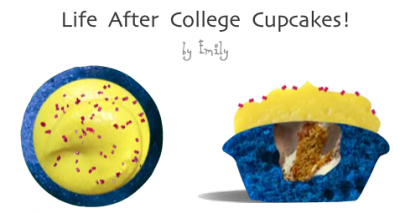 The gallery features over 9000 custom cupcake creations, including the fun “life after college” cupcake (shown left), perfect for upcoming graduation parties. If you decide to buy your cupcakes you have the option of delivery or pick up if you live in Manhattan or have them shipped if you live anywhere else in the US, just remember you have to buy 300 cupcakes! Don’t forget you could always stop by one of the four NYC locations and try one of Melissa’s creations! Hello Cupcake Universe! It is my pleasure to introduce you to the “world’s first cupcake on a pretzel.” Make sure you turn up your volume when you visit the PopsyCakes website, because the PopsyCakes literally POP onto your screen. PopsyCakes started as a high school project and has turned into a national cupcake business. Who wouldn’t want a handmade cupcake, dipped in chocolate, and perched on a pretzel stick? 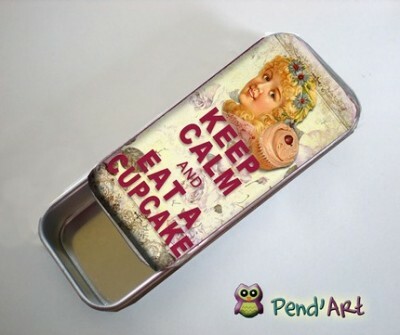 PopsyCakes ships worldwide. You can buy a half dozen or a dozen of several flavors including: strawberry milkshake, dark chocolate decadence, vanilla bean dream, and red velvet rush. Have a new flavor in mind? Share it with them via their website and be entered to win a dozen PopsyCakes! Businesses, you can also order them wholesale! This week’s giveaway comes from a virtual celebrity in the cupcake world! Dollhouse Bake Shoppe’s founder, Lindsay Morton, was the very first winner on Food Network’s hit show, Cupcake Wars. She has taken her sweets from local to national in the blink of an eye and is now selling more than just cupcake products on her adorable site. I received the Cupcake Confetti Kit and adored how everything I needed was right there! One of my favorite things was the adorable box the items came in! I made these cupcakes with my kids and they were very moist and delicious. The directions were easy too follow and you only needed to add a few of your own ingredients. The cuppies did not stay around my house for very long! 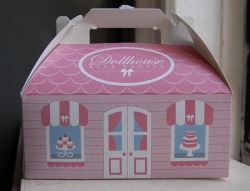 This week, Dollhouse Bake Shoppe is giving away one cupcake kit to a lucky ATC fan! To enter this giveaway, click on the comment area below and tell us what is your favorite item from Dollhouse Bake Shoppe AND what you think they should add to their shop. Special thanks to Dollhouse Bake Shoppe for sponsoring this giveaway! Make sure to become a Dollhouse fan on Facebook and on Twitter. Once again Green Party Goods, a store that sells eco-friendly products for any occasion has hit the cupcake jack pot. 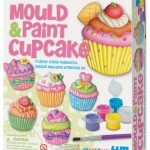 They have so many great things that just came in that are All Things Cupcake worthy! Throwing a cupcake themed party? If the answer is yes then look no further. 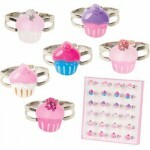 Great cupcake items for your goody bags. I am pretty much an ETSY freak and a lover of handmade vintage like items! 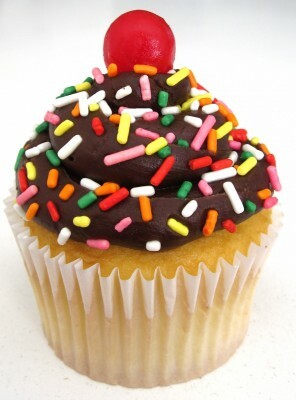 My latest search on ETSY yielded this lovely lil’ cupcake gem. This is totally my style and adorable! The shop owner is a genius for coming up with this one, she must have had me in mind when making it.